These beautiful flowering shrubs are a great addition to your landscape. This guide is about starting a rhododendron from a cutting. Question: Can I Start a Rhododendron from a Cutting? Step 1 Prepare a pot or planting container by filling it with a 50/50 mixture of perlite and peat moss. Then poke a hole in the peat moss mixture for the cutting using a pencil. Step 2 Remove the leaves from the bottom two-thirds of the cutting, leaving at least four leaves on the cutting. Step 3 Strip away the thin outer layer or bark of the cutting on one side starting at about 1/2-inch above the bottom and continuing all the way down so that the inner layers are expose on one side. This will help the roots form. Step 4 Dip the end of the cutting into root growth hormone, making sure to cover the area that you stripped away. Step 5 Poke the cutting into the pot, with the cut end down, so that it stands straight up. Step 6 Water the cutting thoroughly. You can also use sand to root flowers in. How long from planting a cutting till it flowers? Cut the rhododendron at an angle. Put the stem into water. When roots start to form, coat roots in rooting hormone and plant in a potting mix. Use a peat pot, as this can be planted in the ground. Plant in the ground. Fall is the best time. Make an X in the bottom of the peat pot and plant. This article doesn't say how long until they flower. Other sources I have read say 2 or more years. I am with you in that I hope to learn more from this post! It usually takes 2 to 3 years for it to mature !! Rhododendrons are fairly difficult to root. One of the best methods is to air layer a lower limb. You can find several directions on the Internet, both for layering an above ground stem as well as burying a lower limb in the ground. It is too late in the season to attempt rooting them now as it should be done in late spring. Two years is a good wait time for blooms, although some might bloom the first year. Some varieties root better than others. If you know your variety, you can speak with your local county extension agent about the best way to root your plant. No, it's not you. Rhodys are difficult to root, I have successfully rooted them. It takes a long time and it isn't easy for the average gardener without commercial means. Q: I was wondering if there was a way to start an azalea and a rhododendron? I have heard of people clipping a branch and putting it in water (for other plants) and wasn't sure if that were possible with them as well? You can start Azaleas and Rhododendrons with cuttings. Start with terminal 2 to 3 inch cuttings. Remove any leaves and flower buds. With a sharp knife, make a 1-inch slit on each side of the cutting near the base-just deep enough to cut through the bark. This will provide a space for the new roots to emerge. Dip the ends of cuttings in a rooting hormone and insert them 1-inch deep into a small container filled with moist, potting medium made from 50% peat and 50% perlite/vermiculite. Cover each container with a clear, plastic bag (to create a greenhouse effect) and set them in a bright location out of direct sunlight. Fertilizing or further watering shouldn't be necessary until they are transplanted. Root cuttings can be taken anytime, but they are usually most successful when taken in the fall and supplemented with artificial daylight. Take cuttings in the morning when their moisture content is highest. Be patient and expect them to take anywhere from 2 to 6 months to establish a good enough root system for repotting. Plan on starting several in the event that some don't take. Once repotted, fertilizer them once a month. It's a lengthy process but it can be done! You can take a med. limb from bush. Get root hormone from your garden center, put on limb put in ground. in fall or spring. I find if you will cover with glass jar until it gets warm it will do better. Or sit an old milk jug over it to keep it warm. When it starts to get hot in the spring take it off. You can do lots of bushes like that. Katie, I've had very good luck with just sticking rhododendron cuttings in the ground. They grow and make a new plant! Yikes. I found it out by accident. Then, someone told me that you can do this with just about any shrub... I've tried azaleas, but they die on me... In all fairness, I should say they came from Virginia so might not be hardy here in PA... I dont even water the cuttings.. just stick them in the ground. I am anxious to try this with forsythia.. (wink) People will tell you that you need rooting hormone, but in the olden days people didnt have that. You cut a limb of forsythia when it is blooming and stick it in the ground deep enought to cover 2 or 3 nodes and it grows. I haven't tried it except when in bloom. Good luck. In the old days they used talcum powder. My father did this with rose cutting, too! Be sure to cover with a glass jar, with no part of the rose touching the glass! 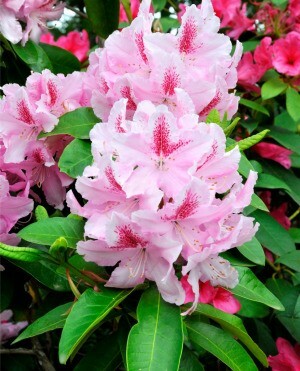 Which fertilizer should I use on rhododendron and azalea cuttings, once a month?